Myant, Martin; Drahokoupil, Jan (2010). Transition Economies: Political Economy in Russia, Eastern Europe, and Central Asia. Wiley-Blackwell. ^ "The Balkans", Global Perspectives: A Remote Sensing and World Issues Site. Wheeling Jesuit University/Center for Educational Technologies, 1999–2002. ^ a b Ramet, Sabrina P. (1998). Eastern Europe: politics, culture, and society since 1939. This definition is fulfilled by Russia, Belarus, Ukraine, Moldova, Romania, Bulgaria, Serbia, Bosnia and Herzegovina, Albania, Montenegro, Kosovo, Greece, Turkey, Georgia, Armenia and Azerbaijan. ^ Berglund, Sten; Ekman, Joakim; Aarebrot, Frank H. (2004). The handbook of political change in Eastern Europe. ^ a b Browse MT 7206 | EuroVoc. Eurovoc.europa.eu. Retrieved on 2013-07-19. ^ Negri, A.P. (2003). Enlargement of the European Union: The First Or the Last Stage of Integration? : XIII Economic Forum, Krynica, September 4-6, 2003. Fundacja Instytut Studiów Wschodnich. ^ Armstrong, Werwick. Anderson, James (2007). "Borders in Central Europe: From Conflict to Cooperation". Geopolitics of European Union Enlargement: The Fortress Empire. Routledge. p. 165. ^ "Greece Location - Geography". indexmundi.com. Retrieved 2014-12-07. ^ "UNdata | country profile | Greece". data.un.org. Retrieved 2014-12-07. ^ Anne Applebaum (2012). Iron Curtain: The Crushing of Eastern Europe, 1944-1956. Random House Digital, Inc. pp. 31–33. With the fall of the Iron Curtain in 1989, the political landscape of the Eastern Bloc, and indeed the world, changed. In the German reunification, the Federal Republic of Germany peacefully absorbed the German Democratic Republic in 1990. In 1991, COMECON, the Warsaw Pact, and the Soviet Union were dissolved. Many European nations which had been part of the Soviet Union regained their independence (Belarus, Moldova, Ukraine, as well as the Baltic States of Latvia, Lithuania, and Estonia). Czechoslovakia peacefully separated into the Czech Republic and Slovakia in 1993. Many countries of this region joined the European Union, namely Bulgaria, the Czech Republic, Hungary, Poland, Romania, and Slovakia. The political borders of Eastern Europe were largely defined by the Cold War from the end of World War II to 1989. The Iron Curtain separated the members of the Warsaw Pact (in red) from the European members of NATO (in blue). Dark gray indicates members of the Non-Aligned Movement and light gray indicates other neutral countries. Russia, defeated in the First World War, lost territory as the Baltics and Poland made good their independence. The region was the main battlefield in the Second World War (1939–45), with German and Soviet armies sweeping back and forth, with millions of Jews killed by the Nazis, and millions of others killed by disease, starvation, and military action, or executed after being deemed as politically dangerous. During the final stages of WWII the future of Eastern Europe was decided by the overwhelming power of the Soviet Red Army, as it swept the Germans aside. It did not reach Yugoslavia, Albania, and Greece, however. Finland was free but forced to be neutral in the upcoming Cold War. The region fell to Soviet control and Communist governments were imposed. Yugoslavia and Albania had their own Communist regimes; after a civil war the Communists lost in Greece. The Eastern Bloc with the onset of the Cold War in 1947 was mostly behind the Western European countries in economic rebuilding and progress. A major result of the First World War was the breakup of the Russian, Austro-Hungarian, and Ottoman empires, as well as partial losses to the German Empire. A surge of ethnic nationalism created a series of new states in Eastern Europe, validated by the Versailles Treaty of 1919. Poland was reconstituted after the partitions of the 1790s had divided it between Germany, Austria, and Russia. New countries included Finland, Estonia, Latvia, Lithuania, Ukraine (which was soon reabsorbed by the Soviet Union), Czechoslovakia, and Yugoslavia. Austria and Hungary had much reduced boundaries. Romania, Bulgaria, Albania, and Greece likewise were independent. All the countries were heavily rural, with little industry and only a few urban centers. Nationalism was the dominant force but most of the countries had ethnic or religious minorities who felt threatened by majority elements. Nearly all became democratic in the 1920s, but all of them (except Czechoslovakia and Finland) gave up democracy during the depression years of the 1930s, in favor of autocratic or strong-man or single party states. The new states were unable to form stable military alliances, and one by one were too weak to stand up against Nazi Germany or the Soviet Union, which took them over between 1938 and 1945. The conquest of the Byzantine Empire, center of the Eastern Orthodox Church, by the Ottoman Empire in the 15th century, and the gradual fragmentation of the Holy Roman Empire (which had replaced the Frankish empire) led to a change of the importance of Roman Catholic/Protestant vs. Eastern Orthodox concept in Europe, although even a few modern authors sometimes state that Eastern Europe is, strictly speaking, that part of Europe where the Greek and/or the Cyrillic alphabet is used (Greece, Cyprus, Serbia, Macedonia, Bulgaria, Ukraine, Belarus, Russia). However, there are methodological problems with this view; Albania uses the Latin alphabet and would be left out of this definition of Eastern Europe, while Greece's status as the cradle of Western civilization and an integral part of the Western world in the political, cultural and economic spheres make its inclusion to Eastern Europe extremely problematic, and it is generally classified as belonging to Southern and/or Western Europe. Under Ashurbanipal (669–627 BCE) the boundaries of the Assyrian Empire reached as far as the Caucasus Mountains in Eastern Europe. Other ancient kingdoms of the region included Armenia, Albania, Colchis and Iberia. These kingdoms were later incorporated into various Iranian empires, including Achaemenid Empire and Sassanid Empire. In 95–55 BCE under the reign of Armenian king of kings Tigranes the Great, the Kingdom of Armenia became an empire, growing to include Kingdom of Armenia, vassals Iberia, Albania, Parthia, Atropatene, Cappadocia, Cilicia, and Atropatene. Owing to the rivalry between Persia and Rome, and later Byzantium, the latter would invade the region several times, although it was never able to hold the region. Bosnia and Herzegovina may be included in Southeastern Europe. Bulgaria is in the central part of the Balkans; it may be included in Southeastern Europe, but also Eastern Europe in the Cold War context. Cyprus is geographically part of the Eastern Mediterranean, but may be included in Southern or Southeastern Europe because of its political, cultural, and historical ties with Europe. Serbia belongs to Southeastern Europe, though on occasion some northern regions (Vojvodina) could be considered Central European. Turkey lies partially in Southeastern Europe: the region known as East Thrace, which constitutes 3% of the country's total land mass, lies west of the Dardanelles, the Sea of Marmara, and the Bosphorus. Most Southeastern European states did not belong to the Eastern Bloc (save Bulgaria, Romania, and for a short time, Albania) although some of them were represented in the Cominform. Only some of them can be included in the classical former political definition of Eastern Europe. Some can be considered as being in Southern Europe. However, most can be characterized as belonging to South-eastern Europe, but some of them may also be included in Central Europe or Eastern Europe. The term "Central Europe" is often used by historians to designate Germany and its eastern neighbors, and thus overlaps with "Eastern Europe." The following countries are often labeled Eastern European by some commentators and as Central European by others. Russia is a transcontinental country in Eastern Europe and Asia. Kazakhstan is a transcontinental country in Eastern Europe and Asia. The Caucasus states are included in definitions of Eastern Europe or histories of Eastern Europe. They are located on the border of Europe and Asia. However they participate in European Union's Eastern Partnership Program. These countries are members of Council of Europe, and Georgia has sought membership in NATO and EU. Some sources place the Baltic states in Northern Europe whereas others such as CIA World Fact Book in Eastern Europe. 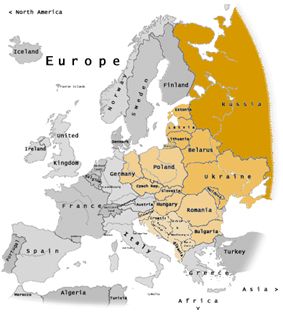 The Multilingual Thesaurus of the European Union defines the following countries as Eastern Europe: Albania, Armenia, Azerbaijan, Belarus, Bosnia and Herzegovina, Bulgaria, Croatia, the Czech Republic, Georgia, Hungary, Macedonia, Moldova, Montenegro, Poland, Romania, Russia, Serbia, Slovakia, Slovenia, and Ukraine. 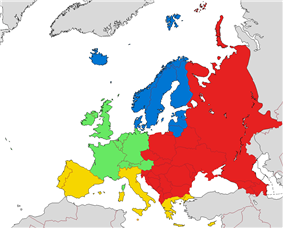 European sub-regions according to EuroVoc (the thesaurus of the European Union). Eastern Europe is marked red on this map. 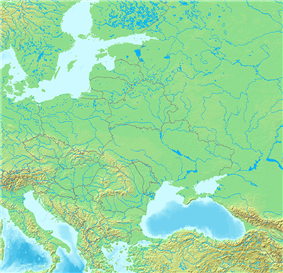 The Ural Mountains, Ural River, and the Caucasus Mountains are the geographical land border of the eastern edge of Europe. In the west, however, the cultural and religious boundaries of "Eastern Europe" are subject to considerable overlap and, most importantly, have undergone historical fluctuations, which make a precise definition of the western boundaries of Eastern Europe somewhat difficult.